Popular Science Blog - Jigga...Where? 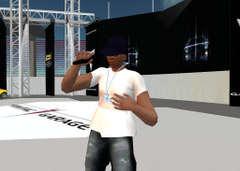 What does Jay-Z have to do with Jimmy Kimmel, Pontiac and Second Life? We’re not sure either, but we wish we were the marketing brains who brought together the strange collaboration that occured in the wee hours of Thanksgiving morning as the reigning king of hip-hop leapt out of retirement with a performance on "Jimmy Kimmel Live" and a simulcast on Pontiac’s SL Motorati Life island. If nothing else, the presence of one of America’s most popular recording artists in SL should make non-believers stop and think for a sec: Maybe this virtual-world thing is more than a passing trend? We were lucky enough to be there—in avatar form, of course—to witness worlds colliding. The long and short of it is, while you were stuffing your face with turkey and enjoying a four-day weekend (but hey, we’re not judgin’—why do you think this post is coming so late? ), Jay-Z was on a manic back-from-retirement blitz, utilizing live performances, record album sales and Web streaming to race into the market on all four cylinders. Since Tuesday, his new album, Kingdom Come, has sold more than 850,000 copies, and his benefit Friday at New York’s Roseland Ballroom, "H2 the IzzO", raised $250,000 for PlayPumps International, an organization that brings ingenious water pumps powered by children’s merry-go-rounds to African villages. That show was also streamed live, on AOL music. Whew. And I thought eating Aunt Dorothy’s giblet dressing was a lot to deal with. that is great. hip-hop mix it up!